Make MP3 to iPhone M4R ringtone, iPad ringtone. 3herosoft iPhone Ringtone Maker is your ideal iPhone ringtone maker to make your own ringtone from various audios or videos for iPhone/iPhone 3/iPhone 4/iPhone 5/iPhone 6/iPod touch/iPad 2/the new iPad/iPad 4/iPad mini which makes you easy to personalize your iPhone ringtone according to your specific needs. With this all-in-one iPhone ringtone making and converting solution, you can make ringtones for your iPhone/iPod touch/iPad from almost all video and audio formats (including AVI, MPEG, WMV, DivX, MP4, FLV, H.264/AVC, MKV, RM, MOV, MP3, WMA, WAV, RA, M4A, AAC, AC3, and OGG. ), and then transfer them to your iPhone/iPod touch/iPad directly. Or copy the iPhone/iPod touch/iPad ringtone files into iTunes library for backup. Meanwhile, you can convert any time length of the video/audio to M4R iPhone ringtone, add fade-in and fade-out effect for iPhone ringtone, control the ringtone volume and pre-listen the original sound or the converted file sound before you make the M4R iPhone ringtone. Even freely and fast manage all ringtone in iPhone to satisfy your need more. iPhone Ringtone Maker fully supports iPhone 3, iPhone 4, iPhone 5, iPhone 5S/5C, iPhone 6/6 Plus, iPod touch, iPad 2, the new iPad, iPad 4, iPad mini. Convert AVI, MPEG, WMV, DivX, MP4, H.264, MKV, FLV, MOV, XviD and 3GP to M4R ringtone. iPhone, iPod touch and iPad have the 30 seconds or 40 seconds ringtone length limitation. 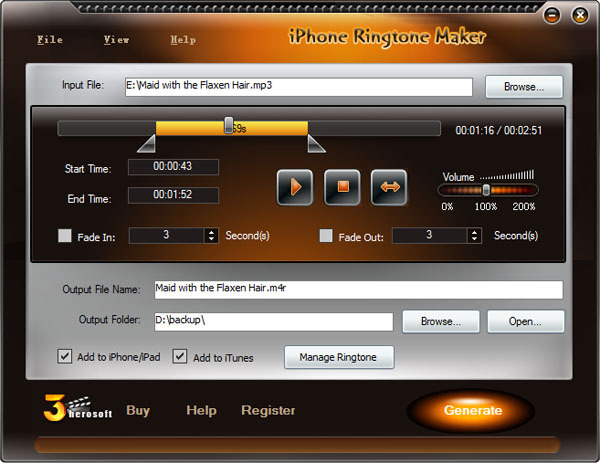 3herosoft iPhone Ringtone Maker can make and transfer iPhone, iPod touch and iPad ringtone longer than 40 seconds. 3herosoft iPhone Ringtone Maker allows you manage ringtones in iPhone, iPod touch and iPad directly, such as renaming, deleting, exporting to PC, exporting to iTunes, etc. Snip your favorite music's chorus or a certain segment of an audio or video file and set it as your unique iPhone, iPod touch and iPad ringtone. Allows you to add fade-in and fade-out effects to your iPhone, iPod touch and iPad ringtone for personalization. Provides two personalized skins for your choice; Supports simplified Chinese and English. How to convert MP3 to iPhone ringtone files, clip music into a ringtone for iPhone/iPad/iPod touch?